Physician Assistants, Shelly Iams and Venice Conley are passionate about their roles as Advanced Practice Providers. Assisting in both Cardiac and Cardiothoracic Surgery at UPMC’s Heart and Vascular Institute, each day offers its fair share of triumphs and trials. As APPs, Iams and Conley both value their specialty because their work is highly motivating, filled with challenge, and extremely rewarding. Check out their thoughts on each professional perk! For APPs, maintaining motivation ensures day-to-day efficiency, and helps foster perspective for long-term patient care. Successfully guiding patients through each stage of the recovery process stands as the ultimate objective! “Seeing patients walk the hallways post-operatively with our cardiac rehab is definitely motivating,” Conley shares. Keeping this goal in mind inspires her to give her best effort in every situation, no matter the circumstance. Similarly, Iams says that patient interaction motivates her most! In fact, being able to talk with patients, explaining the ins and outs of the operating room, is one of her favorite aspects of the job. “Since I have many years of experience in the OR, I feel like I can calm their fears,” she explains. Building an atmosphere of trust is a key factor in patient care. At the Heart and Vascular Institute, APPs gain exposure to numerous cardiac pathologies. Iams comments, “Our physicians operate on the sickest patients – we see and learn a lot!” While some days follow standard routine, other days are fast-paced and hectic – it’s all a part of practicing medicine! No matter what the days hold, it’s important to always have “thick skin,” maintaining professional standards under pressure. Working with highly respected physicians certainly has its advantages! Known for its cutting-edge innovation, the Heart and Vascular Institute is an awesome place to develop as a health care professional! On a daily basis, APPs gain valuable exposure to amazing technologies relating to cardiac and aortic pathologies. Transcatheter Aortic Valve replacements and Robotic Mitrol Valve surgeries, two intricately complex surgeries, are regularly performed at this facility. UPMC’s Heart and Vascular Institute seeks to offer the highest quality cardiovascular care in conjunction with the greatest degree of compassion to all patients and their families. 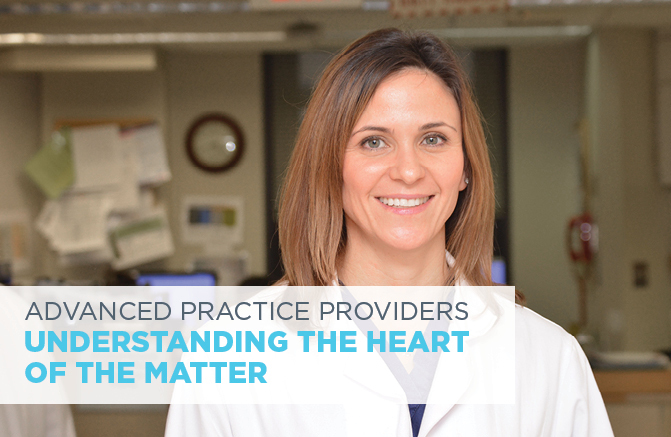 If you desire to deliver excellent cardiac care, consider joining our growing team of Advanced Practice Providers. Don’t wait to start making a difference!